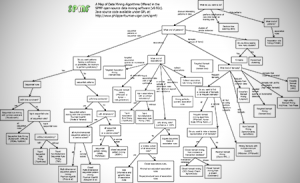 SPMF offers implementations of the following data mining algorithms. These algorithms discover sequential patterns in a set of sequences. For a good overview of sequential pattern mining algorithms, please read this survey paper. the MaxSP algorithm (Fournier-Viger et al., 2013, powerpoint). the TKS algorithm (Fournier-Viger et al., 2013, powerpoint). the TSP algorithm (Tzvetkoz et al., 2003). the FEAT algorithm (Gao et al., 2008). the FSGP algorithm (Yi et al., 2011). the Occur algorithm for finding all occurrences of some sequential patterns in sequences by post-processing. These algorithms discover sequential rules in a set of sequences. These algorithms discover interesting itemsets (sets of values) that appear in a transaction database (database records containing symbolic data). For a good overview of itemset mining, please read this survey paper. algorithms for discovering frequent itemsets in a transaction database. algorithms for discovering frequent closed itemsets in a transaction database. algorithms for discovering frequent maximal itemsets in a transaction database. algorithms for performing targeted and dynamic queries about association rules and frequent itemsets. These algorithms discover episodes that appear in a single sequence of complex events. These algorithms discover patterns having a high utility (importance) in different kinds of data. For a good overview of high utility itemset mining, you may read this survey paper, and the high utility-pattern mining book. the CHUI-Miner(Max) algorithm for mining maximal high utility itemsets (Wu et al., 2019). These algorithms discover interesting associations between symbols (values) in a transaction database (database records with binary attributes). 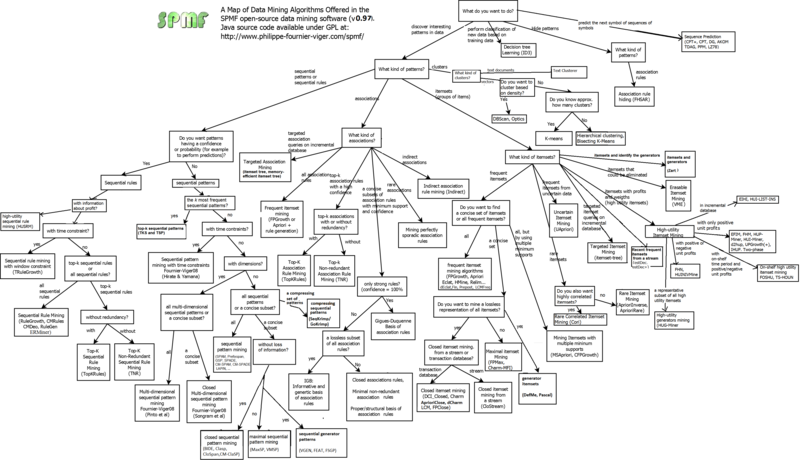 an algorithm for mining closed association rules (Szathmary et al. 2006). an algorithm for converting a time series to a sequence of symbols using the SAX representation of time series. Note that if one converts a set of time series with SAX, he will obtain a sequence database, which allows to then apply traditional algorihtms for sequential rule mining and sequential pattern mining on time series (SAX, 2007). algorithms to cluster time series (group time-series according to their similarities). This can be done by applying the clustering algorithms offered in SPMF (K-Means, Bisecting K-Means, DBScan, OPTICS, Hierarchical clustering) on time series. A tool to resize a database in SPMF format (a text file) using a percentage of lines of data from an original database.